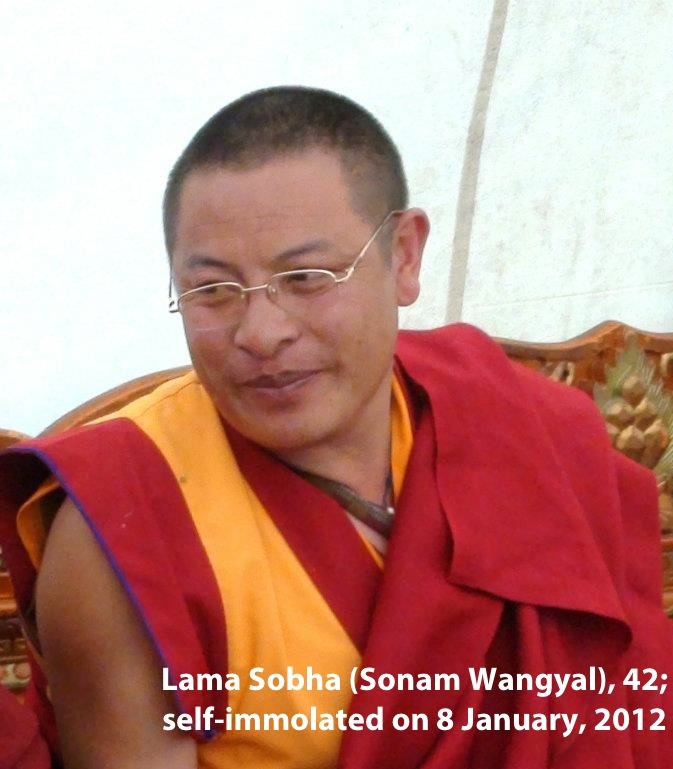 To create better understanding for these acts, I began with quick information on what the political climate in Tibet looked like before the self-immolation of Tapey in 2009, the first one in Tibet. I briefed the audience with the 2008 uprising that started in Lhasa and spread across Amdo and Kham, the mass arrest of Tibetans that followed, the increased surveillance, the massive clampdown on Tibetan communities, and its effects on individual bodies and minds. I quickly went over the number of self-immolations. The number of monks, nuns, lay people, deaths, survivors. I showed the audience pictures of these individuals but asked them to take a moment to realize that these 33 people were living, breathing individuals – normal individuals trying to live their lives. Since most of these acts were carried out by monks and nuns, I wanted the audience to get an idea of what they could have meant for the Tibetan communities in general. I tried to explain the importance of monastics, the institution and individual monks and nuns, to the Tibetan communities. That they served as, among many things, keepers and protectors of the Tibetan culture. Monastics are where the Tibetan spirituality and culture is lived, practiced, shared, and encouraged with the communities. They are places of empowerment, where Tibetans can be Tibetan. For these reasons, the Chinese state views the monastics as threats. They are also threatened by the lack of control and authority it has over the monastics, despite the harsh policies and clampdowns. But who were these individuals? Due to the constraints on time, I decided to do a personal profile of two, very different individuals, of the self-immolaters. Lama Soepa and Tsering Kyi. “I am sacrificing my body both to stand in solidarity with them in flesh and blood, and to seek repentance through this highest tantric honor of offering one’s body. This is not to seek personal fame or glory. After this, I reminded them again of what the monastics meant, in very different ways, to the Tibetans and the Chinese state. Tsering Kyi was a 20 year old Tibetan girl, an exceptional student at her school and the first, along with her sister, in her family to get a modern education. She and her family were nomads. The nomadic way of life has been systematically attacked, and more, for the last few decades. In one of the articles on Tsering Kyi, her relative mentioned how she often enjoyed laying on the grasslands watching the stars at night as the winter approached. As I said this, I unconsciously pictured the moment and felt a rush of emotion at how real Tsering Kyi was. I held my emotions back and asked the audience to imagine your way of being slowly being taken away from you and your family, and being forced to live a whole different way not by choice. What would you do? How would you feel? The audience seemed to ponder along with me. So what would cause a person to self-immolate? I told the audience it’s hard to guess what their personal reasons were. 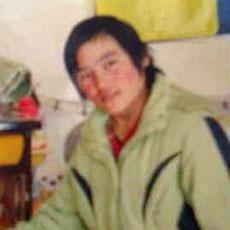 The only people who came close to telling us were Lama Soepa and Jamphel Yeshi, who self-immolated in Delhi on March 26, 2012 and left a letter addressed to fellow Tibetans that was later found in his room. The audio by Lama Soepa and the letter by Jamphel Yeshi both express deep pain, suffering, and also power. But how can we begin to understand this power? I briefly highlighted the magnitude and the consequences of political protest in Tibet. The arrest, torture, and possible death. That under arrest, the state controlled your body, and did what they wanted to do with it. They could even choose to end a life. I told the audience honestly that it is hard to speculate why these individuals choose self-immolation but some things could still be read in these actions. In the moment of the act, these individuals were taking back the authority (from the Chinese state) over their bodies, their mind, and their speech. They even took control of their own death. That this is where you can locate their power even under repressive state control. 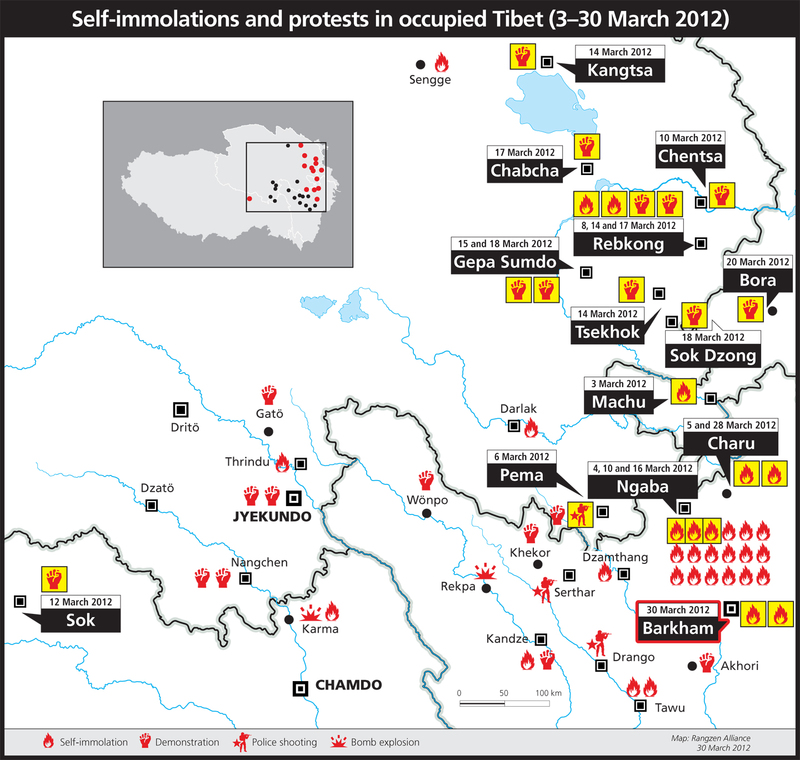 I went back to showing them the maps of the self-immolation’s and protests in Tibet. Most of these actions have taken place in Amdo and Kham. 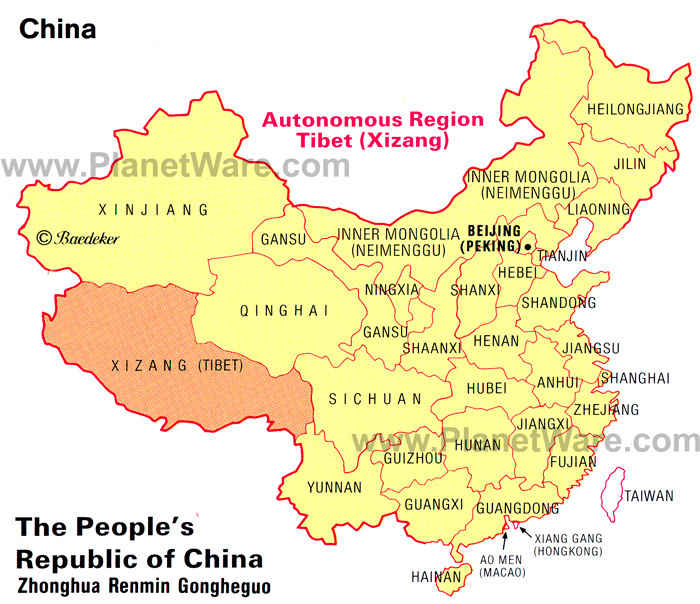 Both are claimed and divided by China as Qinghai, Sichuan, and Gansu. 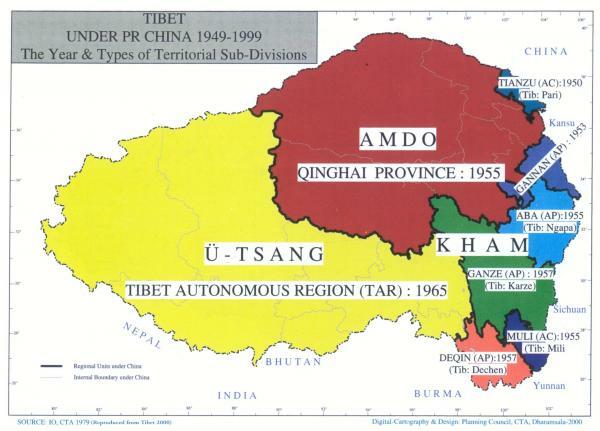 In modern maps, only Utsang is shown as Tibet (Tibetan Autonomous Region). Kham and Amdo have been sucked into greater China. However, these protests and self-immolations have made their marks, so much so that their bodies, in my opinion, have symbolically carved Tibet out of China, and reclaimed theirs, and our, homeland as Tibet and Tibetan. I showed the Lhakar movement video for the audience to understand that there are movements inside Tibet that highlight Tibetan agency and power. That the state may occupy the overall structural power in Tibet but it did not mean individual Tibetans did not have power and resist. I ended the talk with what the audience can do. 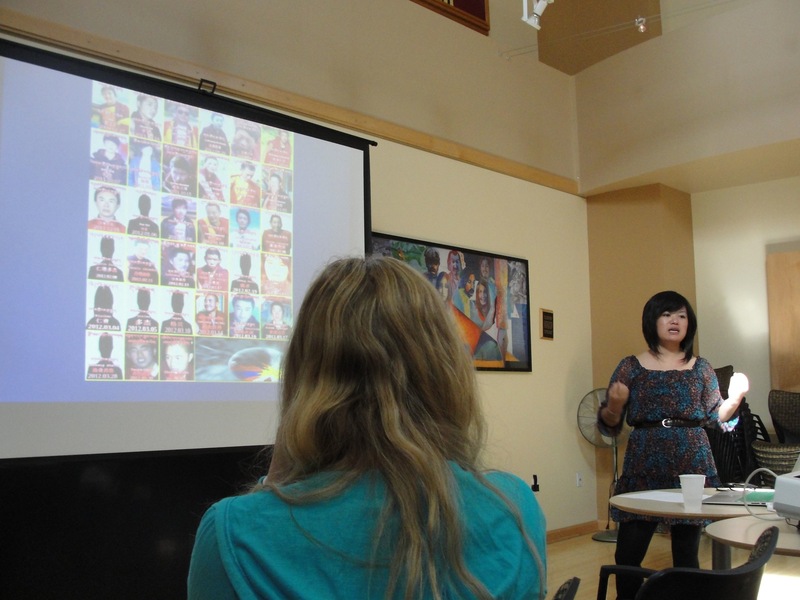 I began by first telling them to educate themselves about Tibet by simply reading and gave helpful websites. Than I asked them to visit standupfortibet.org to find out what actions, including calling their representatives, they can take to get those voices from inside Tibet heard. It is not always easy to talk about such a topic, but it is important, however, to talk. And to do it as honestly, without sensationalizing or romanticizing, as possible. Because our job as carriers of those voices demand that we try our best to remain as honest and as true to those voices in the moment that they spoke.